Metropolitan Cook Book is my second Recipes of the Damned effort in this project, and while the small booklet has a lot more recipes than Tempting Low-Cost Meals for 2 or 4 or 6, I found it just as challenging when it came to finding recipes I was actually willing to cook. While I was cataloging my collection I made a vow that I would not make any recipe that forced overcooking of vegetables, as noted by instructions such as “add the tender [asparagus] tips [to boiling water] the last 15 minutes” (which is approximately 14 minutes 30 seconds too long to be boiling asparagus) or “boil Brussels sprouts 15 to 20 minutes.” Unfortunately, for the Metropolitan Cook Book this ruled out nearly anything involving non-starchy vegetables. The meat recipes all seemed rather heavy, more suited to cold weather; the pastry recipes were tempting but I thought I should try not to make cake all the time. So potato salad won the draw. 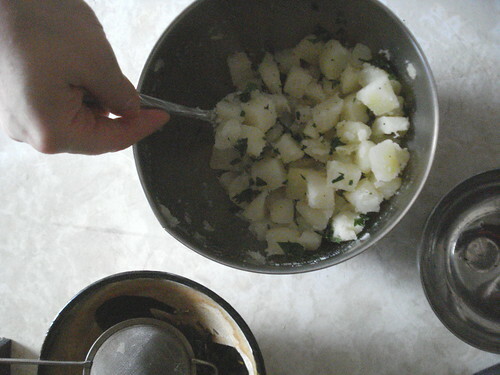 I’ve never been terribly enthusiastic about potato salad, having had some pretty dull specimens over the years. I didn’t have high expectations for this recipe. 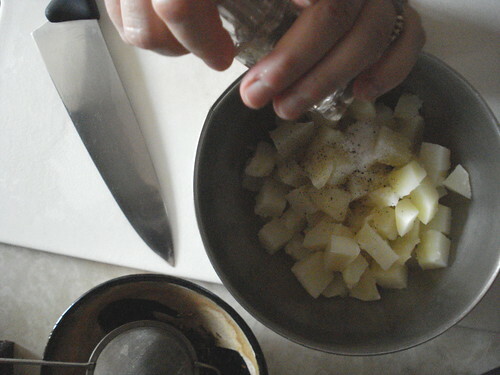 It’s quite simple: cooked potato cubes, salt, pepper, onion juice (obtained by cutting off a chunk of an onion and squeezing), parsley, olive oil and vinegar. It’s so simple it’s virtually foolproof, which is a good thing since the instructions seem to take a lot for granted. 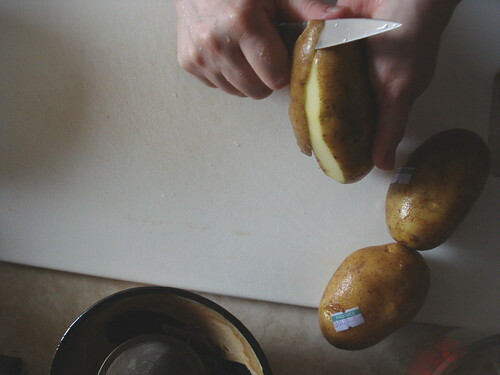 The ingredients list “2 cups freshly boiled potatoes,” and the first instruction is “Cut potatoes into 3/4 inch cubes.” So does one boil the potatoes whole and then cut them up while hot? Cube them before boiling? How long to boil? 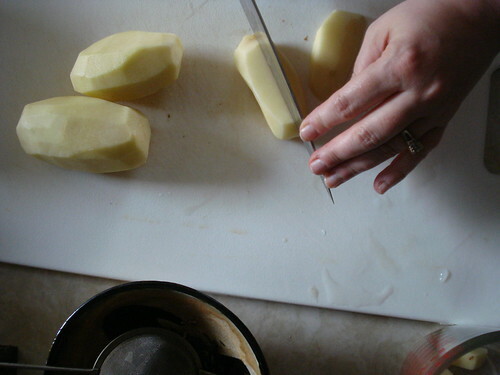 I threw caution to the wind and peeled and cubed the potatoes before boiling them for about 15-20 minutes, paying less attention to the clock than to their texture when poked with a fork; when they were tender but not mushy I drained them off and proceeded with the seasonings. When I had mixed it all together I covered the bowl and refrigerated it. 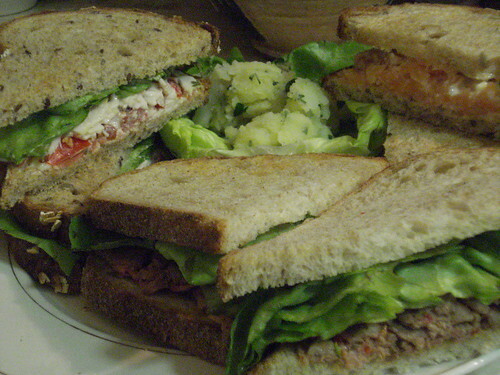 I served the potato salad with a cold supper of sandwiches (see the upcoming entry on 500 Tasty Sandwich Recipes for details), and was pleasantly surprised. The potato flavor was pleasant and not overpowered by seasonings, and the texture was a nice complement to the lettuce on which I served it. Verdict: Success. I would make the potato salad again. But I still refuse to boil asparagus to death. Posted in: 107 Cookbooks, Booklets and flyers, Recipes of the Damned.